There's been a flurry of Star Wars news as of late, with fans on edge due to rumors that LucasFilm is planning on making a big announcement regarding Star Wars: Episode VII. Maybe it's a teaser trailer, maybe it's a title and release-date reveal, or maybe it's some combination of all that -- regardless, we're all jonesing for something, anything. In the weeks leading up to what may finally be some official news, we've been seeing all these random videos connected to the original trilogy pop up online, like early trailers, rare blooper reels and more. 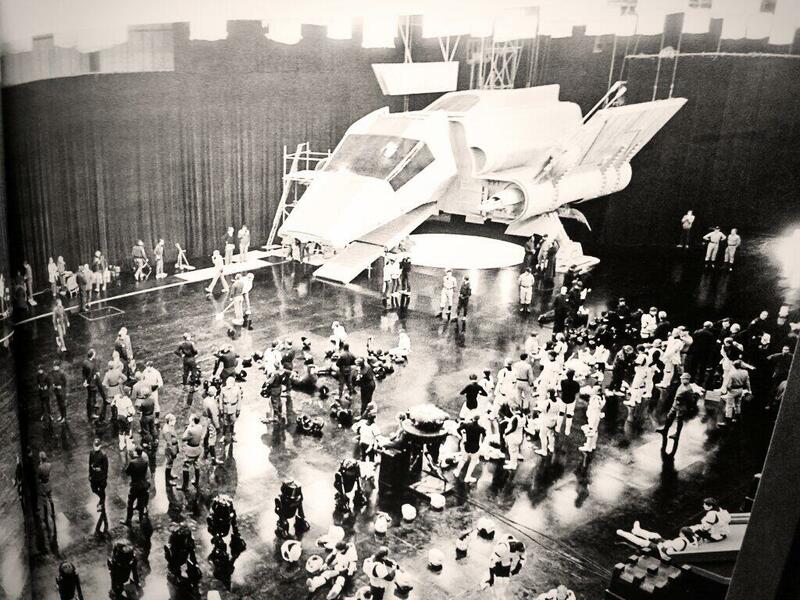 Along those lines, here's one behind-the-scenes image from Return of the Jedi that really took us back. This is a shot of the Death Star 2 hangar bay set, and right away you'll recognize it as the home base for some of Jedi's biggest moments, like when the Emperor arrives at the beginning of the movie, or when Darth Vader dies in Luke's arms at the end. From the looks of it, this pic was snapped during a downtime in shooting, as we see various stormtroopers just hanging out with their helmets off. There are various droids off to one side, some Imperial officers and a whole ton of crew members. The scenes shot on this set had such a profound effect on me as a child, and so on a personal note it's really weird looking at this image and seeing a cluttered stage instead of a menacing enemy base. There are curtains in the background instead of a galaxy full of stars, and the floor looks all scuffed up and dirty versus the black metallic shine it has in the finished movie. Here are a couple of scenes from Return of the Jedi that were shot on this stage.